Pictured from left to right: Brantley Gilbert, Country Artist, Keith David, Managing Director of Task Force Dagger Foundation, Greg Abbott, Governor of Texas, Chuck Yerry, Task Force Dagger Foundation. NASHVILLE, Tenn. (May 15, 2015) – Tonight, Friday, May 15 at 9 p.m. ET/PT on the CBS Television Network, ACM Presents: Superstar Duets two-hour special will bring some of country music’s brightest stars together on-stage for never-before-seen duet performances – the product of a two-day live event taping in Arlington, Texas leading up to the 50th Annual Academy of Country Music Awards. But what a lot of viewers don’t know, is that ticket proceeds from the live event went to support a great cause: ACM Lifting Lives®, the philanthropic arm of the Academy of Country Music®, and military philanthropies. 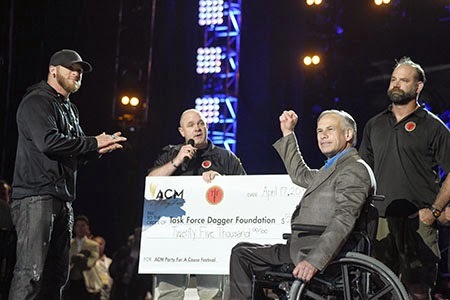 One of those military institutions was the 501(c)(3) non-profit, Task Force Dagger Foundation, which was presented a $25,000 check donation on stage at the April 18 taping in Arlington, Texas by country music star Brantley Gilbert and Texas Governor Greg Abbott. Task Force Dagger Foundation’s managing director, Keith David, (pictured, center) and Chuck Yerry (pictured, right) were on hand to accept the generous donation on the foundation’s behalf. Board members of Task Force Dagger Foundation say they will use the contribution from ACM Lifting Lives® to fuel their primary mission and provide immediate financial assistance to wounded and ill soldiers and their families, as well as the families of fallen soldiers of The United States Army Special Operations Command. “Task Force Dagger Foundation is very judicious in how we disburse our funds and we are working very diligently to ensure that where the money will go is where it is supposed to go: to soldiers and their families,” said Keith David. “We are honored and humbled by this generous gift from ACM Lifting Lives® and we look forward to witnessing improvement in the lives of those brave and heroic soldiers who've served our country as a result." This isn't the first time Task Force Dagger Foundation has seen support from the country music community. The Journey Home Project, another non-profit organization deeply rooted in the country music industry, with country legend Charlie Daniels as its Chairman of The Board, and Daniels’ long-time manager, David Corlew as its co-founder, has been one of the biggest supporters of the mission of the Task Force Dagger Foundation. Find out more about the Task Force Dagger Foundation and how to get involved by visiting http://www.taskforcedagger.org. For more information on ACM Lifting Lives®, visit http://www.acmliftinglives.org.